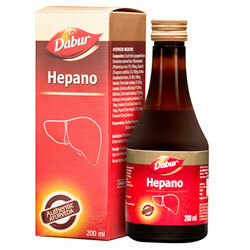 Dabur Hepano Syrup For liver health by protecting it from various hepatotoxins. Enriched with Herbs like Bhumiamlaki, Guduchi, Nimba, Haritaki, Kalmegh etc. For liver health by protecting it from various hepatotoxins. Flavoured Syrup Base - Q.S. Bhumiamlaki (Phyllanthus niruri, Pl) -Taste inducer (Rocana) , useful in Amlapitta (Hyperacidity), Pandu (Anaemia), Hepatosplenomegaly and Jaundice. Guduchi (Tinospora cordifolia) - Strength promoting (Balya), Digestion promoter (Dipana), Rejuvenator (Rasayana), Blood purifier (Raktasodhaka), useful in Jaundice (Kamala)and Anaemia (Pandu). Neem (Azadirachta indica) -Neem is used for tastelessness conditions. It is having anti-parasitic, anti-inflammatory, antiulcer and hepato-protective effects. Kalmegh (Andrographis paniculata)-Digestion promoter properties and is used in Ajirna (dyspepsia), Jvara (fever), Kandu (itching), Kamala (jaundice) and Yakrtvikara (disorders of liver. Haritaki (Terminalia chebula) - Rejuvenator, Antioxidant, Laxative. It is used as appetizer and is used in tastelessness conditions, jaundice, hepato-splenomegaly, Anaemia etc. Amla (Emblica officinalis) - Mild purgative, agni deepak (Digestion promoter), Skin diseases, inflammation, It is a potent Rasayana (Rejuvenating agent) and Bulk promoting (Brmhaniya). Vibhitaki (Terminalia belerica) - Laxative, diuretic and cardio tonic treatments. Kutki (Picrorhiza kurroa)- Digestion promoter properties and is used in Jaundice and tastelessness conditions. 1-2 teaspoonful (5-10ml) twice a day or as directed by the physician.